These moist, delicious, pillowy soft pumpkin cupcakes have all the fall spices you love, filled with homemade vanilla pudding and topped with an easy, perfectly sweet vanilla buttercream pumpkin! My pumpkin spice cupcakes are chock full of real pumpkin, cinnamon, ginger, allspice, cloves and nutmeg! I cored and filled with a home made vanilla pudding, then topped with buttercream; both regular and pumpkin-shaped! I have a soft spot for pumpkin everything but as you might know, I hate fondant. Yes I use it but only on the rarest of occasions. It just doesn’t taste great. So I was determined to pipe some pumpkins for these cupcakes and not shape them out of rock-hard sugar paste you have to pick off before eating. How many cups are in a can of pumpkin? A 15oz can of pumpkin is 2.5 tablespoons short of 2 cups. If you buy the 29-ounce can of pumpkin, it holds about 3 1/2 cups cups of purée. After applying the white buttercream you can smooth it with a knife or spatula. If it’s a bit troublesome try dipping your tool in very hot water, patting it try then swiping that over your cupcake. 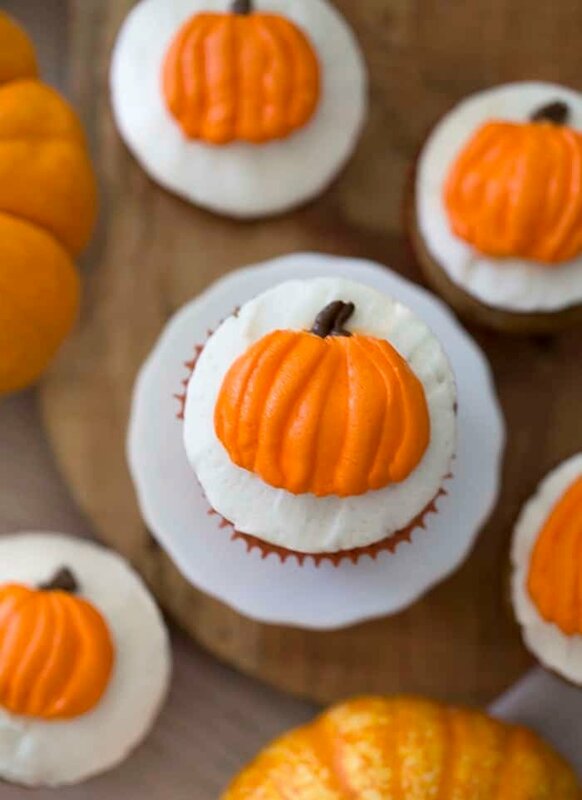 On another note you might want to make these cupcakes with a more simple decoration and in that case may I suggest whipping up a batch of the browned buttercream from my pumpkin poke cake? 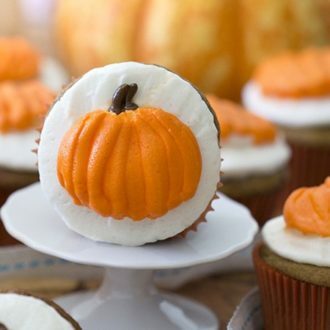 Don’t be afraid to clean up the pumpkin with a toothpick if there are stray bits of buttercream marring your gourd. If you don’t have a cupcake corer you can use a small knife to hollow out the middle. The recipe makes more vanilla pudding than you need. But you will not be complaining about having some extra delicious home made pudding to snack on! I tried some different brands of pudding mixes and even the fancy organic ones weren’t nearly as good as the home-made kind. I think it’s the vanilla they use. How do you make easy pumpkin cupcakes? For the frosting; whip the butter for about 5 minutes using a paddle attachment (stand-up mixer). Beat in the confectioners sugar slowly. Add the salt, cream and vanilla and beat until you have an even, fluffy consistency. Reserve a couple tablespoons for the stems. Add a few drops of brown and mix. Reserve ⅓ for the pumpkin. Add some drops of orange until you reach a desired consistency. For the filling; whisk the sugar, cornstarch, and salt in a saucepan. Add the milk into the sugar mixture and stir until a paste is formed. Add milk and the egg yolks. Cook the mixture on a low heat and add butter and vanilla. Stir while cooking until thickened then transfer to a bowl to cool completely. You can whisk in an optional 1-2 tbs of butter at this point. Transfer the mixture to a bowl and create an airtight seal with plastic wrap. Place in the refrigerator for about an hour until chilled. 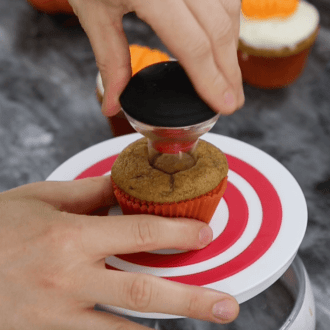 For the assembly; with a cupcake corer or the reverse side of a piping tip, core a hole. Pipe the filling into the cupcake. To pipe the white base, fit a piping bag with a number 3 round tip and use to create a white circular base for your pumpkin by piping in a circular motion. Fit another piping bag with a 143 tip and fill it with the orange frosting to pipe your pumpkin. You might need to use a small knife to clean the edges to shave the pumpkin. Pipe the brown stem using a small round tip and there you have your pumpkin cupcake! Enjoy! Delicious pumpkin cupcakes filled with homemade vanilla pudding and topped with buttercream pumpkins! 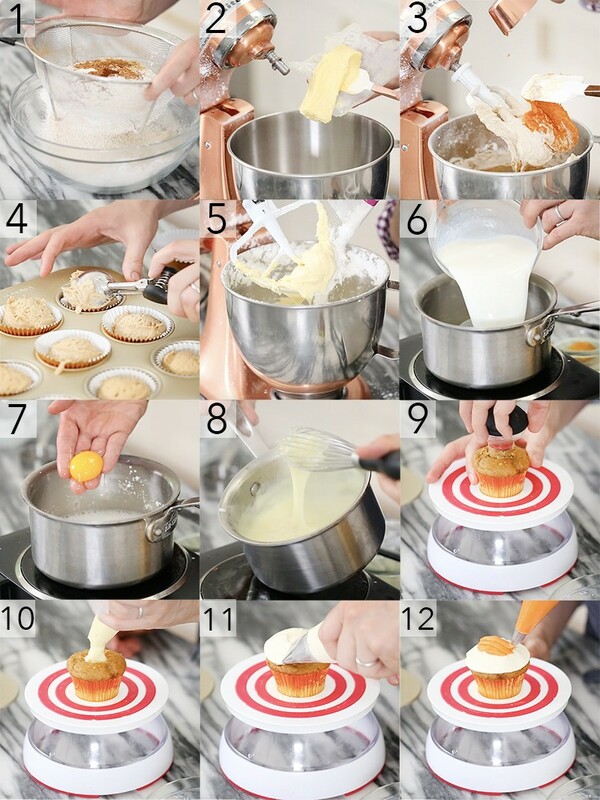 Pour batter into cupcakes papers. Bake at 350 degrees for about 18-20 minutes, or until the center is set. Add the salt, cream, and vanilla. 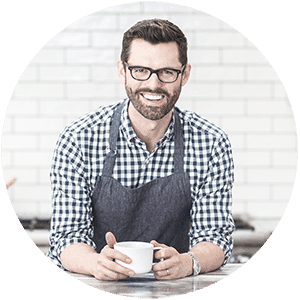 Beat until you have an even, fluffy consistency. Reserve a couple tablespoons for the stems. Add a few drops of brown and mix. Reserve ⅓ for the pumpkin. Add drops of orange until you reach a desired consistency. Cook the mixture on a low heat, while stirring continuously. Let the mixture thicken and don't over boil. Turn off the heat. Add butter and vanilla. 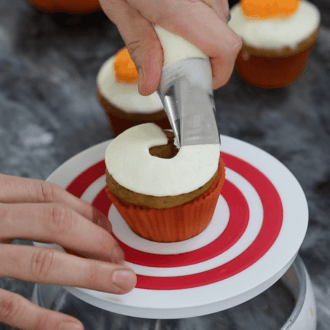 With a cupcake corer or the reverse side of a piping tip, core a whole. Pipe filling into the cupcake. To pipe the white base, fit a piping bag with a number 3 round tip. Pipe in a circular motion. Use a cake icing tip to create a white circular base of your pumpkin. Pipe another closed circle on top for the pumpkin itself. Pipe the pumpkin using a 143 tip with the bag filled with orange. You might need to use a small knife to clean the edges to shave the pumpkin. Pipe the brow stem using a small round tip. After applying the white buttercream you can smooth it with a knife or spatula. If it's a bit troublesome try dipping your tool in very hot water, patting it try then swiping that over your cupcake. 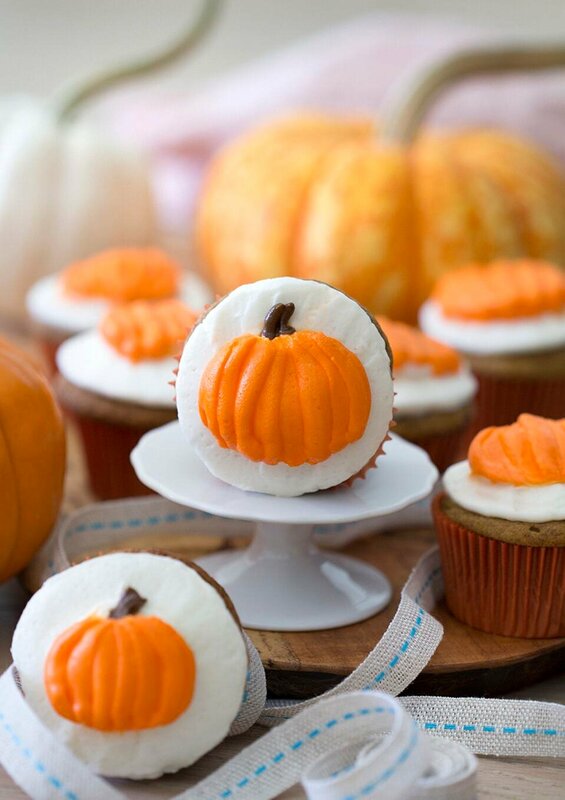 Don't be afraid to Clean up the pumpkin with a toothpick if there are stray bits of buttercream marring your gourd. Can I use orange extract to substitute orange blossom water? You could. I like orange blossom water because it is a very subtile flavor since its distilled from actual orange blossoms. Orange extract will be a much stronger orange taste. If you’re wanting more of an orange taste, then it’s perfect! That is very sweet, I’m so glad you enjoyed them so much!!! Did you pipe pumpkins on top too? I haven’t made this yet, but can i sub whole milk for 2%? Hi, I had made the recipe, but the quantities in gr. are wrong, example: the cloves, say 50gr. and actually I think has to be 4gr. to fill 1/4 tsp. the same is with nutmeg and all spices. I did it with 1/4 tsp of each, anyway after bale it the cupcakes were very soft, pasted in the muffin pan. When I measure out 1 tsp of the spices, I get 2g. Since the recipe calls for 1/4 is why I put .50g. I have added the correct amount of butter into the filling recipe. Did the cupcakes bake all the way through? Hey, Can I use a whole can of pumpkin instead of 3/4 cups? That might be bit much for the recipe. You could definitely add in a few more tablespoons if desired though.